He ended his ten year-long political campaign in a televised speech lasting around 11 minutes. In that speech Iraqi cleric Muqtada al-Sadr said a number of disturbing things: that current Iraqi Prime Minister Nouri al-Maliki is a dictator, that Iraq’s Parliament is paralyzed and that the country’s judiciary is too politicized. But perhaps the most disturbing things were the questions left unanswered. And there were many. 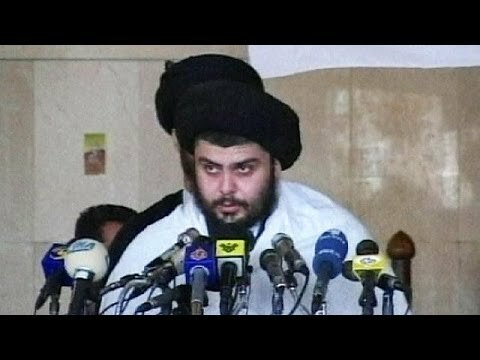 Al-Sadr was born in 1973, the child of a well known and well respected Shiite Muslim family, based in Najaf. As the Middle East Quarterly reported back in 2004, he is “the fourth son of Ayatollah Muhammad Sadiq al-Sadr, who was, between 1992 and 1999, one of the most renowned leaders in the Hawza, the centre of Shiite religious seminaries and scholarship”. Muqtada’s father “cultivated good relations with the predominantly Shiite tribes of central and southern Iraq, even publishing a book on tribal Islamic jurisprudence,” the journal wrote. The Sadr family were persecuted during the regime of former Iraqi leader Saddam Hussein and after the death of his father and two brothers at, most likely, the hands of government assassins, Muqtada assumed a leadership role in the family – and therefore with their many followers. And after many years of guiding those followers – in both bad, violent times that saw them take military action against the US as well as in calmer times, when he disarmed the Sadrist militia – it appears that al-Sadr is now ready to stand down. In order to clarify his decision, al-Sadr then made a televised speech on Tuesday in which he said his decision was irreversible. Besides criticizing the current government and judiciary in that 11-minute speech, al-Sadr also stressed the importance of participating in the upcoming elections, in order to bring about the change that Iraq needed. Al-Sadr’s decision was unexpected – most political observers were waiting for a showdown at Iraq’s general elections in April, between the Shiite Muslim Prime Minister, al-Maliki, and other Shiite Muslim leaders like al-Sadr. And almost immediately various parties gave different reasons as to why al-Sadr might be retiring. At first some thought it was a tactical move, designed to show how bad things had become. After all, al-Sadr has said he would retire from politics before but then changed his mind. Some said that al-Sadr was disappointed with those close to him, including politicians in his own party who had recently voted for a law giving local MPs various financial privileges – al-Sadr has always been an advocate of social welfare and has had many supporters from lower income areas like Sadr city, and he was opposed to this law. As was the leading Shiite Muslim authority in the land, the Ayatollah Ali al-Sistani, who told Iraqis not to vote for those MPs that supported the law. However this hardly seems enough to make al-Sadr retire: he is powerful enough within his movement that he could dismiss anyone in his party he chose, if they behaved inappropriately. Others felt it was a good move by al-Sadr, in that he was moving toward a separation of church and state and allowing new political leaders to come forward. Journalists who had interviewed him in the recent past also commented on al-Sadr’s clear disillusionment and disappointment. The big question now is what will happen to his political bloc. The Sadrist bloc’s political party, the Ahrar party, holds 40 seats in Iraq’s Parliament and is important as part of the coalition that brought al-Maliki to power; Ahrar is basically the political wing of the multi-million-member Sadrist movement. The Sadrist movement also fields six of the Iraqi cabinet’s 26 ministers and it has 58 representatives on the 447-seat provincial councils. A few short hours after al-Sadr announced his resignation, dozens of his politicians on provincial councils announced that they too would resign. If those decisions turn out to be final, their loss would cause a political vacuum. This happened despite the fact that al-Sadr told politicians to keep serving the country. Other analysts are already suggesting that Prime Minister al-Maliki will be the big winner here as he will play upon sectarian sympathies to overcome recent antipathies between the Sadrists and his own party, and win them onto his side. Following on from this one must also ask what will become of the hundreds of bureaucrats and other staff, related to the Sadrist movement in politics. And what of the millions of Shiite Muslims who follow al-Sadr, living in places like Sadr City, the long-neglected suburb of Baghdad that’s home to 3 million Shiite Muslims? Of most concern to many is what will happen to the Sadrist movement’s militias. After the US-led invasion of Iraq in 2003, al-Sadr mobilized a massive, Shiite Muslim military group that was known as the Mahdi Army. This group was held responsible for much of the violence against American troops as well as the conflicts that nearly plunged Iraq into a sectarian, civil war. However over the ensuing years, the Sadrist movement disarmed; it has also been engaged in community work and now it even seems to be becoming popular with Iraqis that did not previously support it. After US forces left the country, al-Sadr announced that the Mahdi Army would disarm. The majority of his followers in that militia did as he asked but some joined other Shiite Muslim militias, like the now-more-extremist League of the Righteous. It is thought that, with al-Sadr’s resignation, more Shiite Muslims may join the League. Concerns have also been expressed about the Promised Day Brigades, another Shiite Muslim militia associated with the Mahdi Army. Those militias used to be active in and around places like Sadr City – now inhabitants fear they might become so again. Even the militias are afraid of what will happen now that al-Sadr is leaving politics. It is not just Iraq’s Shiite Muslims who are worried. The country’s Sunnis had also held out hopes for al-Sadr’s political future. Over the past few months al-Sadr has been publicly supportive of the Sunni Muslim anti-government stance, paying close attention to that sect’s complaints of exclusion and marginalization by al-Maliki. He had even joined Sunni Muslim clerics in prayer. It had seemed increasingly realistic that Sunni and Shiite politicians might get together to oust al-Maliki. Al-Sadr heads the most powerful Shiite Muslim group and together the parties could have expelled the current prime Minister. A similar scenario had already played out after provincial elections changed the balance of power in Baghdad’s local government. Even opposition leader, former Prime Minister Ayad Allawi, said he was shocked to hear about al-Sadr’s resignation. Allawi actually fought al-Sadr’s Mahdi Army while he was in power in 2004. The next big event on Iraq’s political calendar is the upcoming federal election, due to be held at the end of April. Many have suggested that al-Maliki may now benefit most from al-Sadr’s supporters’ votes. But this is by no means certain. Simply because al-Sadr has withdrawn from politics, doesn’t mean that he couldn’t still direct his followers to cast their ballots the way he would like them to. One party that may well benefit is the Islamic Supreme Council of Iraq, a mostly Shiite Muslim party headed by younger cleric Ammar al-Hakim. The recent past has seen al-Sadr and al-Hakim form political alliances in certain circumstances for their mutual benefit and against al-Maliki. “Any decline in the political status of the Sadrist bloc will be a loss for the broader national front that’s calling for a new course for Iraq,” writes Sarmad al-Taei in the Al Mada newspaper. Also certain is that, in general, the political outlook just became a little more precarious – this may escalate sectarian tensions in the country even further. If al-Sadr really does withdraw from politics and close all his offices, the country will have to work through a power imbalance of the kind it has not had to deal with yet.